Growing up, one of my favourite books was called Children Just Like Me. It came complete with a writing set and a correspondence programme through which I connected with my teenage penpal, Purity, from Kenya (who is now a Facebook friend). It was a picture book, all about children who live in different cultures around the world. 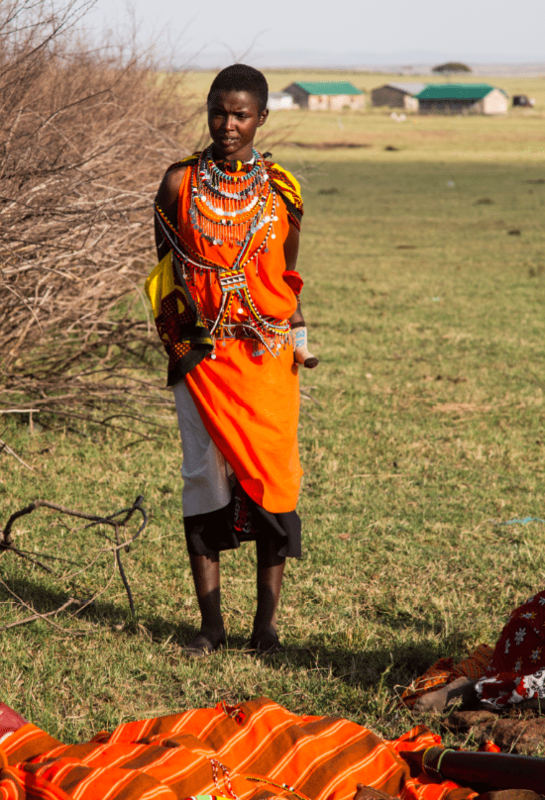 I was fascinated by all of them but, in particular, the Maasai girl, Esta. Her clothes were so colourful and her home was so drastically different from mine. That this August, I met a real Maasai child, in his village, in Kenya, is still surreal to me. 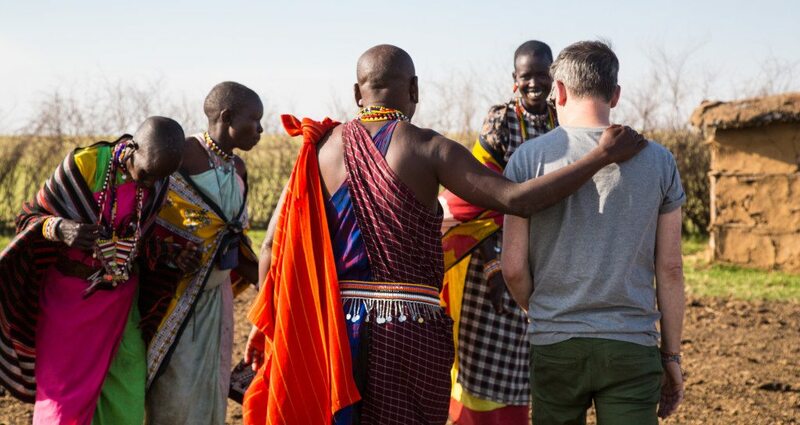 At the end a full day watching elephants and lions in the wild, we drove for what seemed like hours to get there, bouncing over the dirt roads with our safari guides, Joseph and Kappen – also from the Maasai community. Finally we came to an area of vast nothingness apart from a school and next to that, a tiny white church. 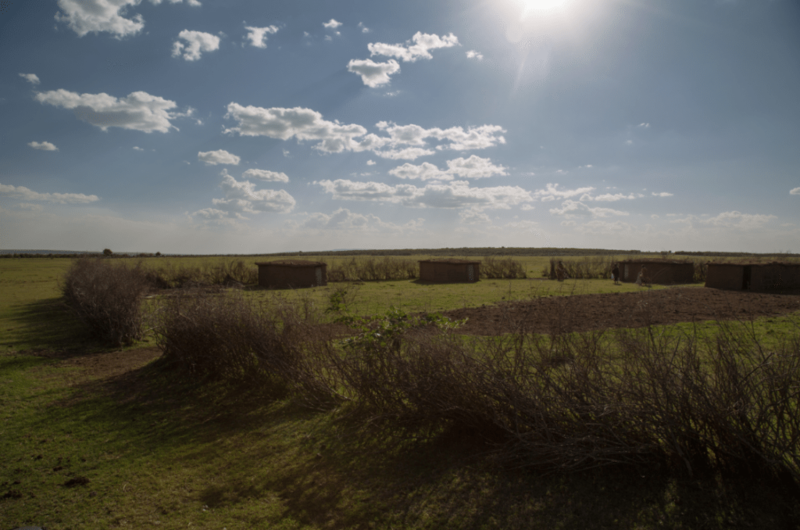 Set back was a stick fence (called a Kraal, and full of acacia thorns to stop lions from attacking cattle at night) circling a group of huts and a huge herd of grazing cows. We were the object of much curiosity as a few women and children approached the landrover to greet us. We stepped down onto the grass, cow dung everywhere. I first shook hands with a woman who was barefoot, a few of her toes and a cracked heel carelessly squashing into the nearest brown pile. 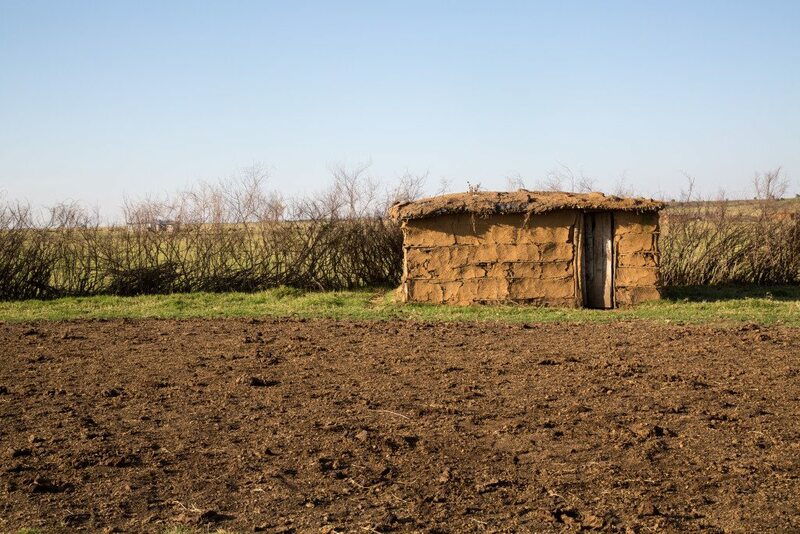 I later learned about the Maasai’s relationship to cows and saw a photo of a woman building one of the huts on her bare hands and knees, spreading dung across the roof. Had those lessons come first, this wouldn’t have surprised me. 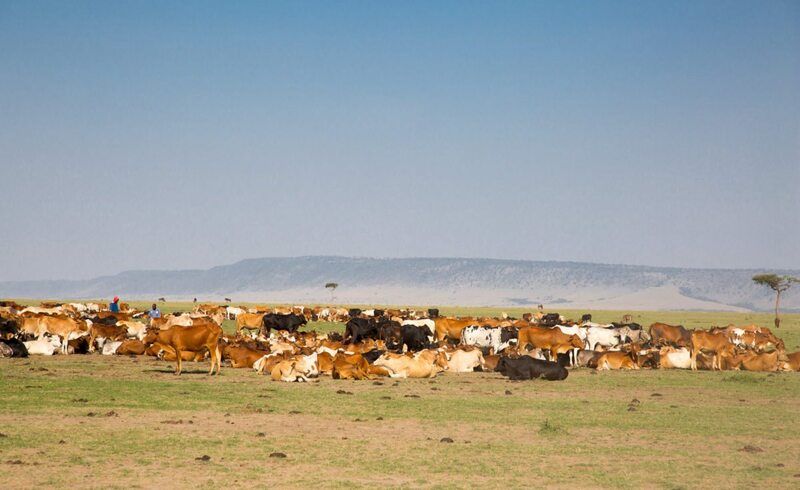 Traditionally, Maasai were simply cow herders. They still are in many cases, but modernisation and globalisation have come with the Western tourists and now they are also entertainers of safari-goers. On one hand, they have a chance to make some money. 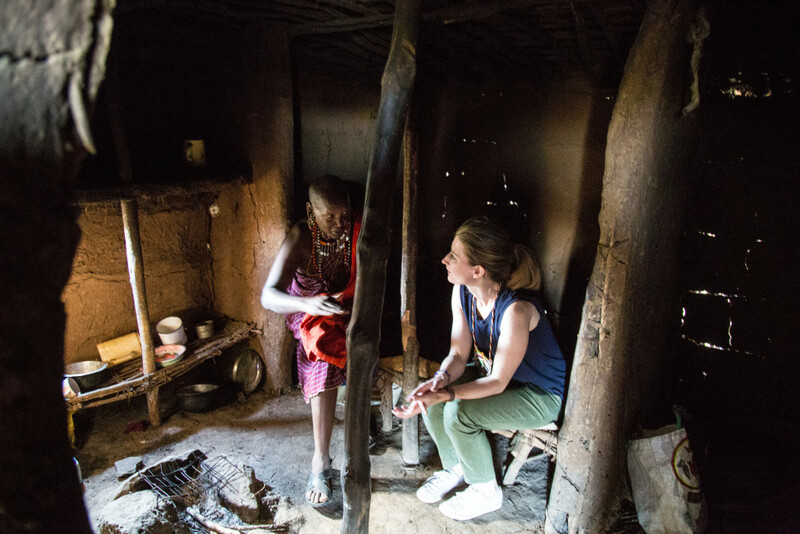 It gave us a very memorable encounter and the opportunity to learn about this mysterious culture and bring that knowledge back home. On the other hand, their lifestyle has changed quite a bit to cater to the curiosity of tourists. 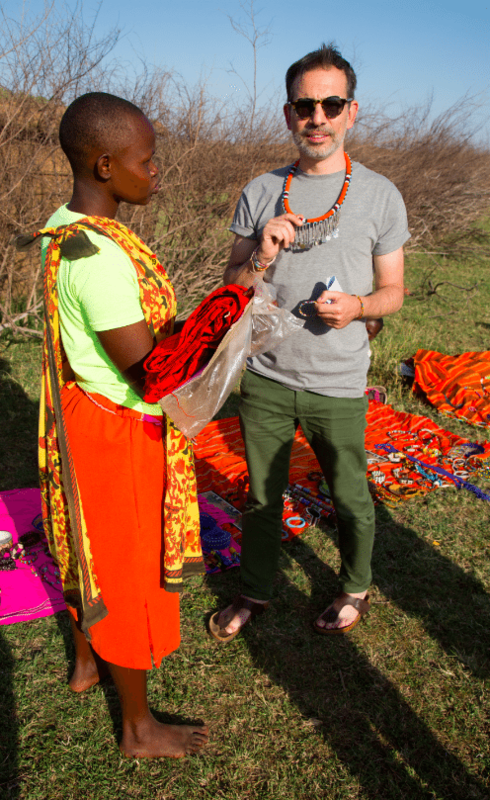 The money we spend while we’re there all goes to the matriarch of the village who we were told uses it for clothing and children’s school uniforms and doles out a percentage to the crafters whose goods we purchase. I’ve heard a good percentage of that also goes back to the guides who bring the tourists to the village. Fair play. All this behind-the-scenes stuff seemed a bit inauthentic, but nevertheless I took it for what it was and enjoyed a bit of insight into their lives. A kind and welcoming bunch, they have a routine when the landrover arrives. It starts with a welcome song and dance. Actually, it starts before that when the money changes hands for the show and the right to enter their space. They welcome you not only with a song and dance but with beaded necklaces placed over your head (that they hope you will later buy). They coax you into joining the jumping and shouting and allow photographs to be taken in the process. After that, we were led into a hut (called an Inkajijik). The doorway was shorter than me by a few inches. Inside, we were plunged immediately into darkness until our eyes adjusted. 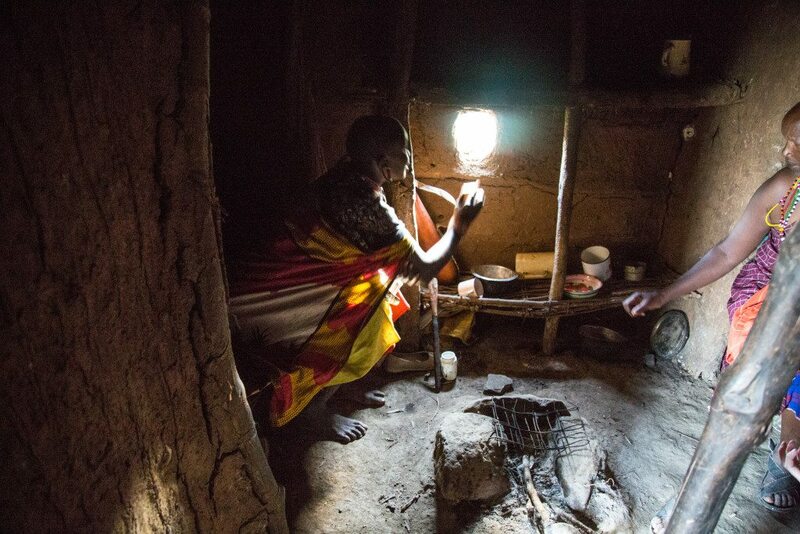 There’s no electricity and no toilet. At the back there is a small room with two beds and a space for a fire in between. Next to the fireplace, a hole in the wall allows the smoke to escape. Cow horns are used as cups (traditionally washed with fresh urine, which apparently acts as a mild antiseptic). Cow hides are used to sleep on. Other than a small pot and a spoon, there weren’t many material posessions in the room at all. 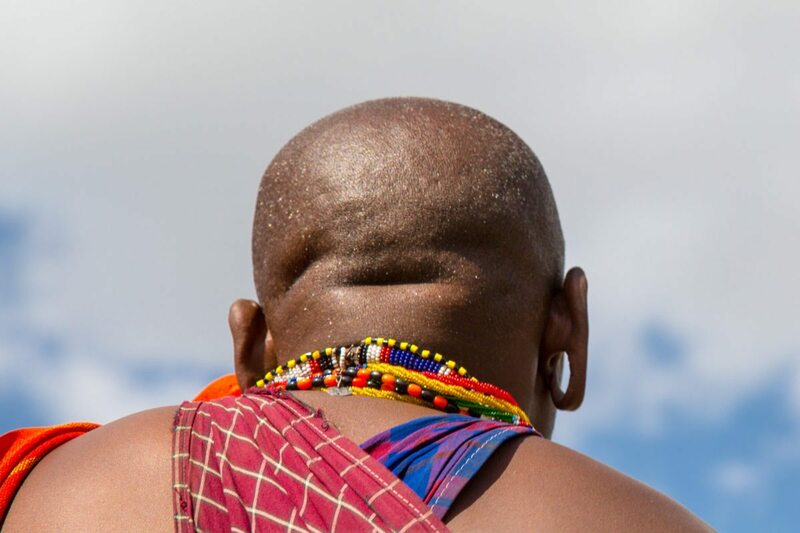 The Maasai are polygynous. The woman who took us into her hut is the 4th wife of her husband. A man can have as many wives as he can handle, but only if he treats them all equally and spends the same amount of time with each one. If not, the village elder gets involved. 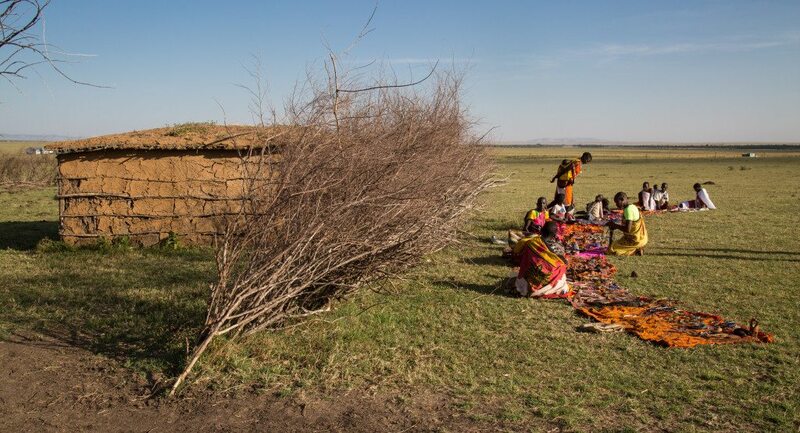 Each wife has her own hut. The husband makes his rounds alternating nights. There are two beds, so that when the husband is in the hut for the night, the woman slides over into his. 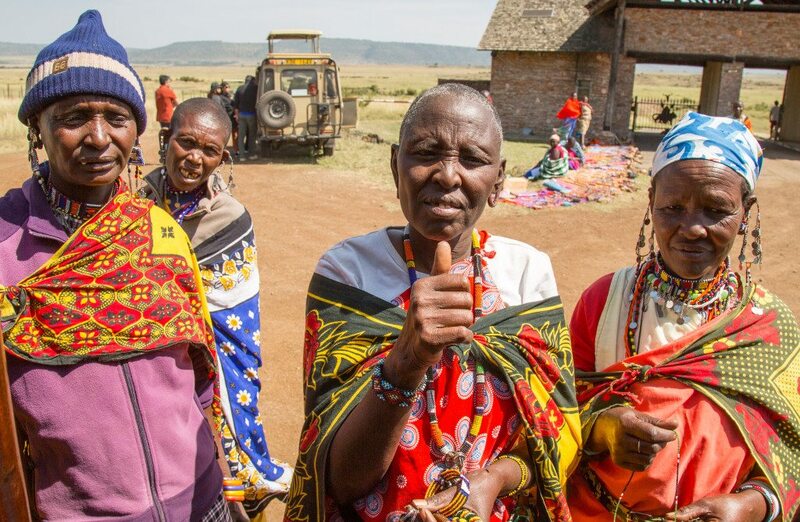 These days, women help the family make a living by selling blankets and beaded jewellery to tourists while men might train to become safari guides or spotters. Others have moved out of the rural lifestyle and take on government or office jobs, integrating themselves with city life. Earlier that day, we stopped by a group selling at the entrance to the reserve and they were incredibly pushy, following us back to the car and even sticking their arms inside it. Not the greatest business skills there, but the group in the village we visited were lovely. 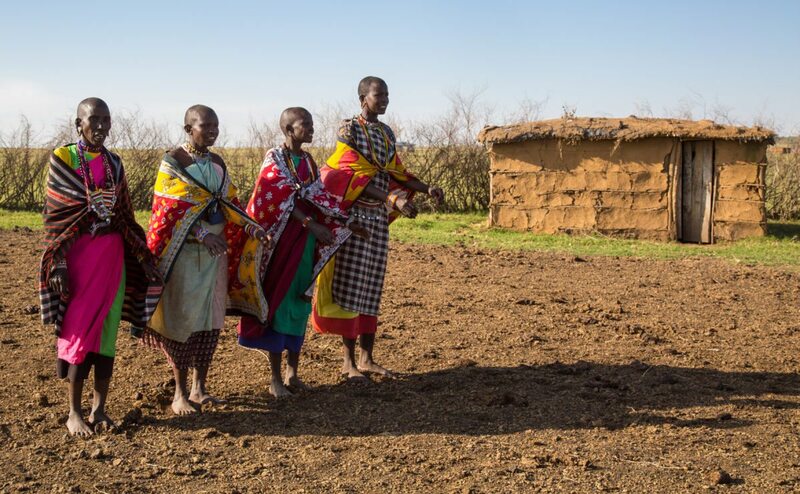 Typically, Women are in charge of work like building the homes, collecting water and firewood, milking cows, looking after the children and cooking for their families and guests while men take on the role of security guards ensuring the safety of their family and cattle. While we were in the village, the men were all in a meeting at the school so we only met a group of women and children who set up a makeshift market for us behind their kraal. A little boy came up to me and introduced himself, in English, as Ben (purple shirt, below). He must have been about 10-years-old. He was fascinated by my camera and wanted to push the buttons to look through the photos I’d taken earlier that day. He’d lean in really close and exclaim “Lion!” or “Elephant” or look at me and grin and say, “That’s you!” I taught him how to take a photo and put the camera around his neck so he could take some pictures. He was loving every second of it. Later, he watched as I was decked out in a Maasai blanket. He got a kick out of that one too. I think meeting him was the best part of the village experience because it was the most genuine connection I was able to make. I could have spent hours there chatting with him, but the women who set up the market for us waiting for us to have a look at their jewellery. Later that evening, we shared our stories with some of the other guests and Lara and Kyle who run the Offbeat Mara camp where we were staying. They told us a bit more about the Maasai culture, how they traditionally don’t bury their dead (except important chiefs) because they believe it’s harmful to the soil. Bodies are left to the scavengers. We talked about how they have, in many places, been forced into farming because life with only cattle is not as sustainable with government restrictions on their movement through wildlife reserves; how women shave their heads; how the boys go through a circumcision ceremony with no aesthetic and how, during the procedure, any noise is a sign of weakness. 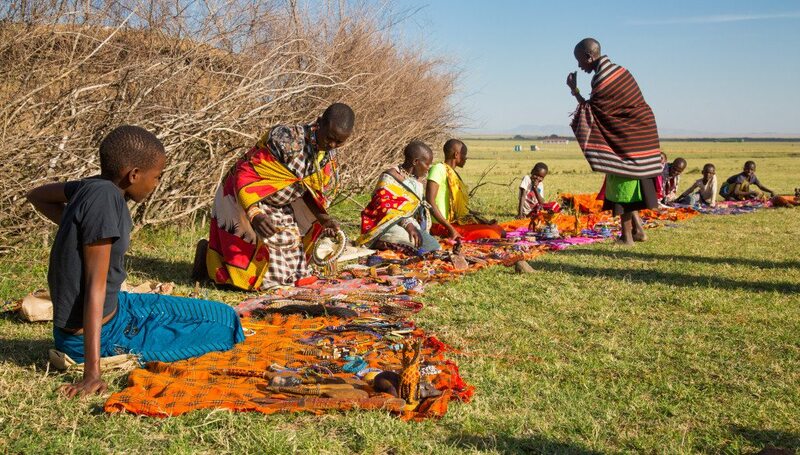 To avoid rejection from males, women are also traditionally circumcised, a practice that has been, in some cases, now been replaced by a “cutting with words” ceremony involving singing and dancing instead of a knife. 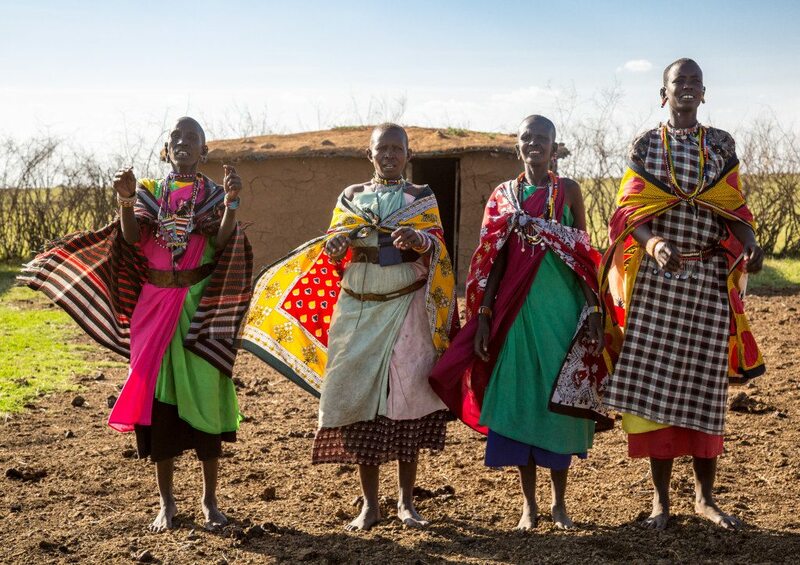 Female genital mutilation is illegal in Kenya but it’s a law that’s difficult to enforce in rural areas. 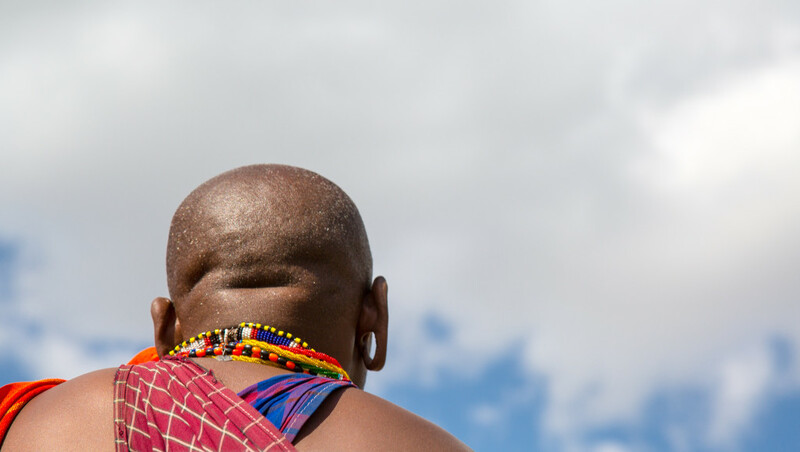 It’s an ongoing battle that Maasai women’s rights activist Agnes Parei has been known for fighting. She has set up a safe house for girls who are trying the escape the cutting and to bring awareness of the practice to light in the wider world. At the camp that night, we also talked about cows. 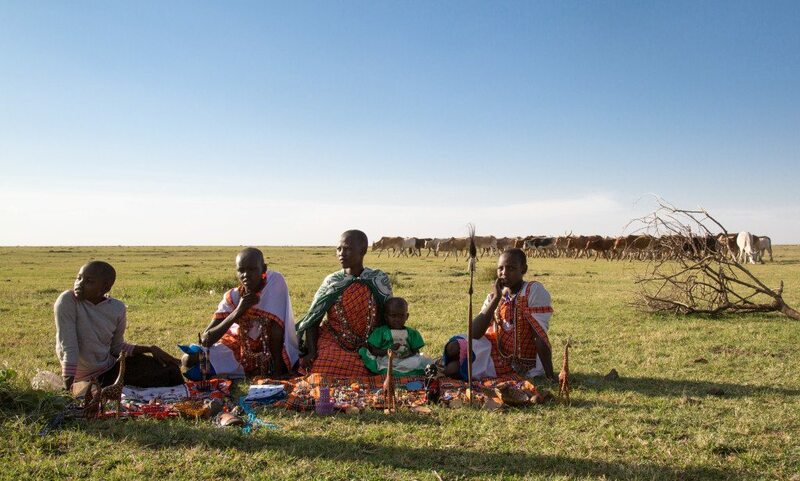 The cow is a sign of prestige and wealth to the Maasai people. The more cows, the merrier. 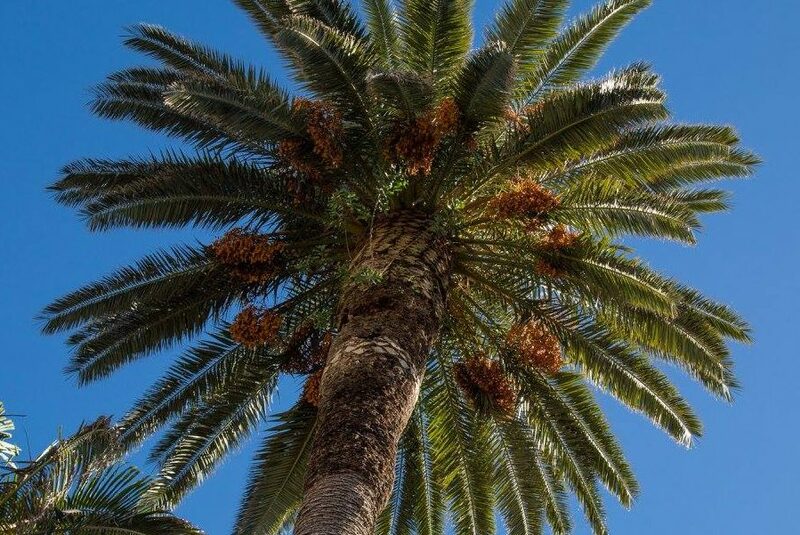 They are used as currency, exchanged before marriages, sacrificed for ceremonies and even used to keep the peace if something goes wrong with a neighbour. The cows are typically only eaten when times get tough. Goats or sheep are used for meat instead. When cows are slaughtered, the horns are used for storage and hides for everything from bedding to weapon sheaths to sandals to jewellery. Cow milk and the blood are used as a drink. Dung is not only used in construction, but also as fuel for the fire. 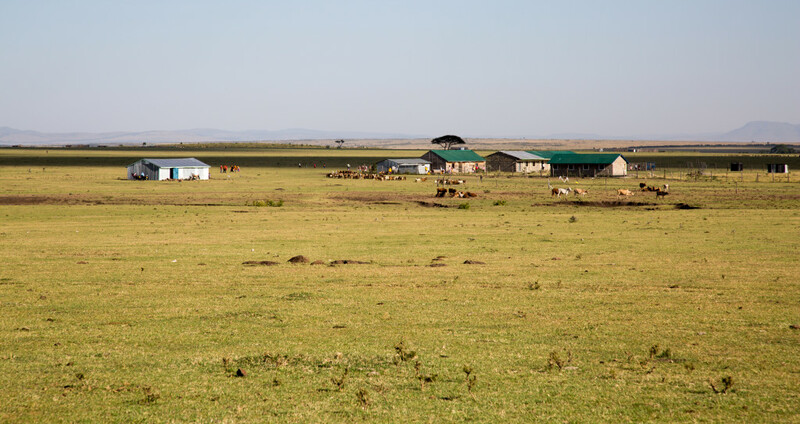 To show the importance of the cow, a greeting might be, “I hope your cattle are well.” Maasai are semi-nomadic, moving when their cows need a fresh pasture. They believe that their god entrusted all of the world’s cattle to them for safe-keeping. 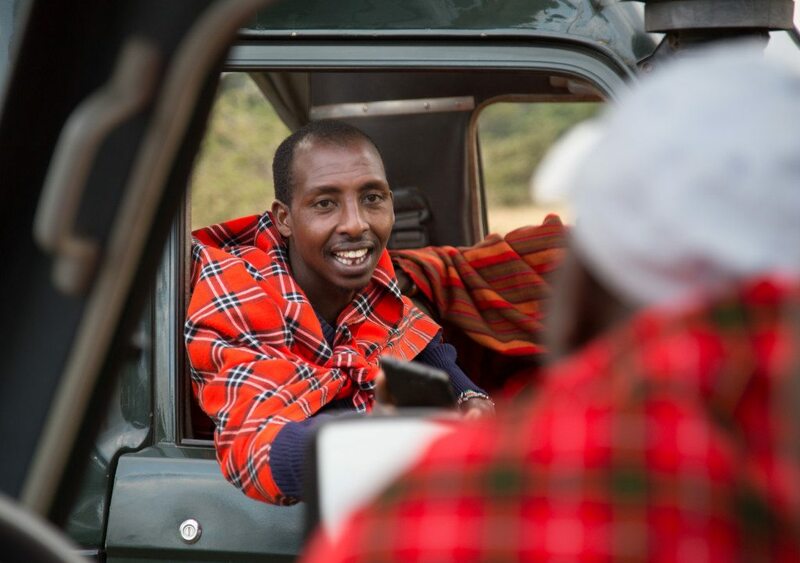 During our time in the Mara, we also spoke quite a bit with Joseph and Kappen – our safari guide and spotter. 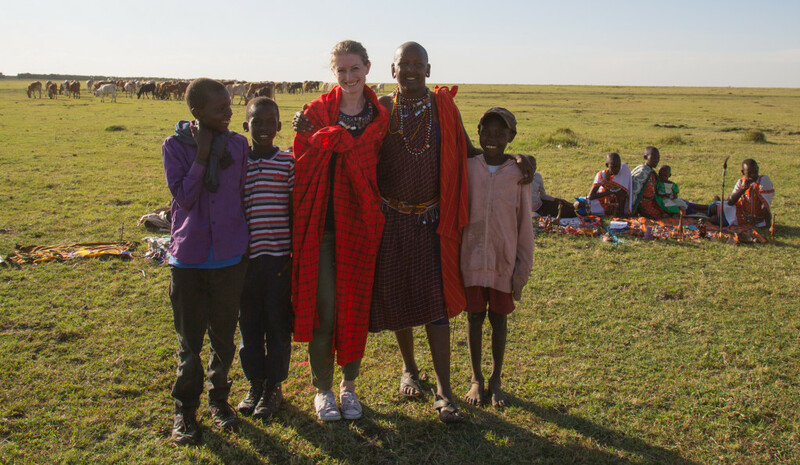 I’ve interviewed Joseph to find out a bit more about the Maasai culture first hand and what it’s like to be a safari guide, so look out for that on the blog in a few weeks! 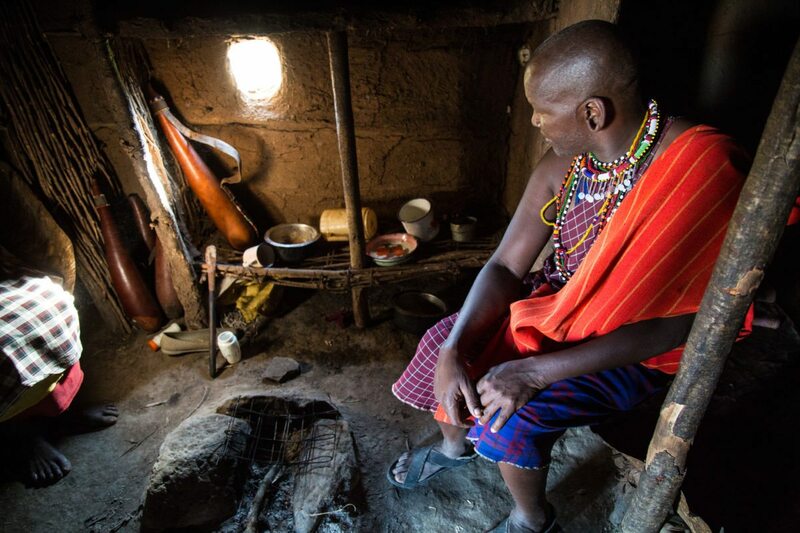 Wow it’s really interesting story a bout the maasai village. But Stephanie guides from offbeat we don’t take any money from the village. Hi Joseph! Thanks and thanks for giving us this experience. 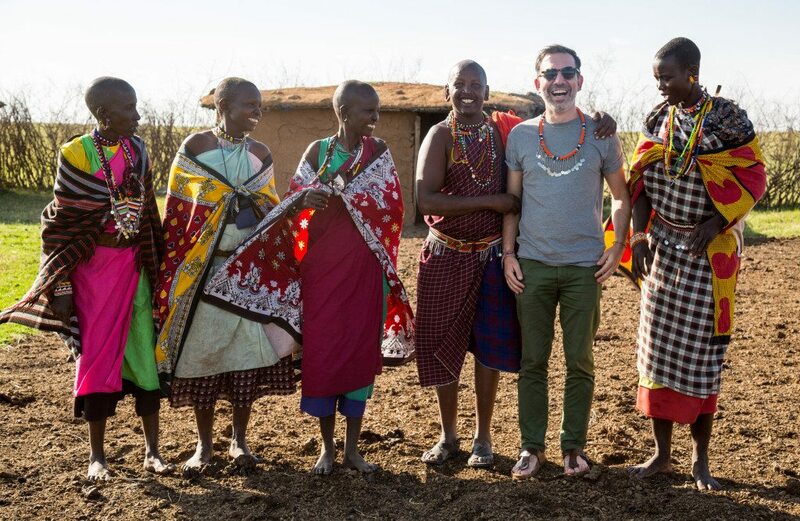 Interesting to know about the money – I guess it is certain safari guides from different camps that we were told about that get a percentage for bringing guests. I’m planning a trip to Kenya and Tanzania with my children. I have an 8 year old and a 10 year old. 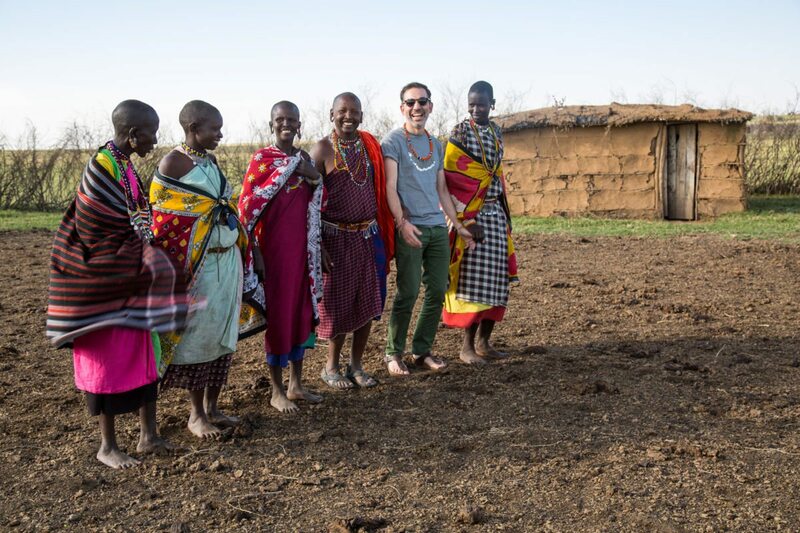 I appreciate your candor that the Maasai have become entertainers for the tourists. I would like to share this experience with my children but I do not want to take advantage of people or sign up for an inauthentic experience. Any advice?